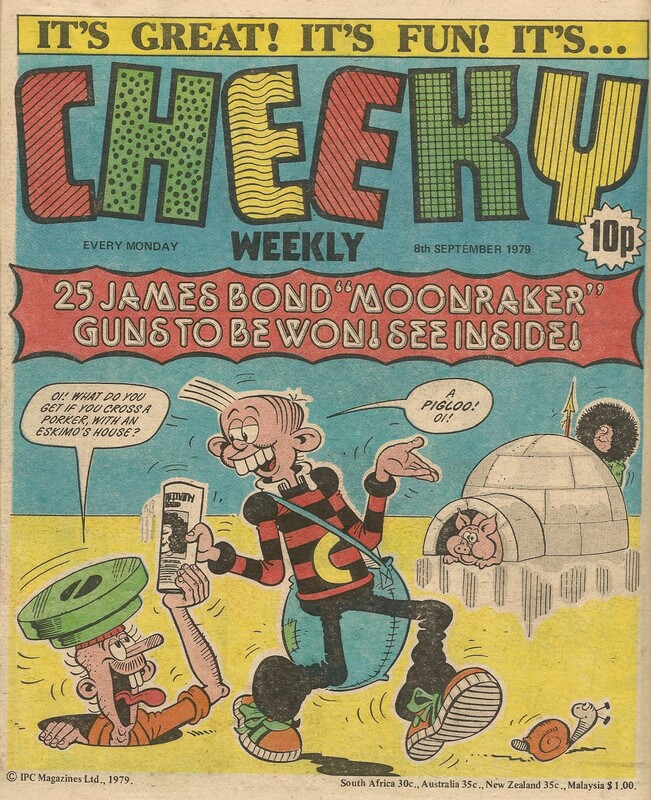 The ever-excellent Great News blog is taking a look at another issue of Cheeky Weekly, and confronting the uncomfortable issues that arise when considering certain aspects of the comic from today's perspective. Is it really two and a half years since my last One-Offs post? 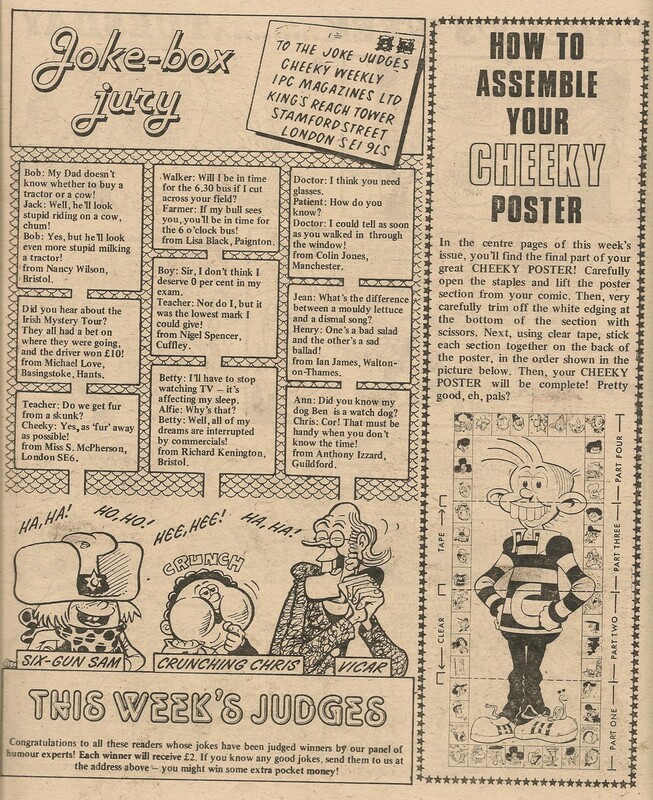 Time to rectify the situation with a glance at Cheeky Weekly dated 30 June 1979. 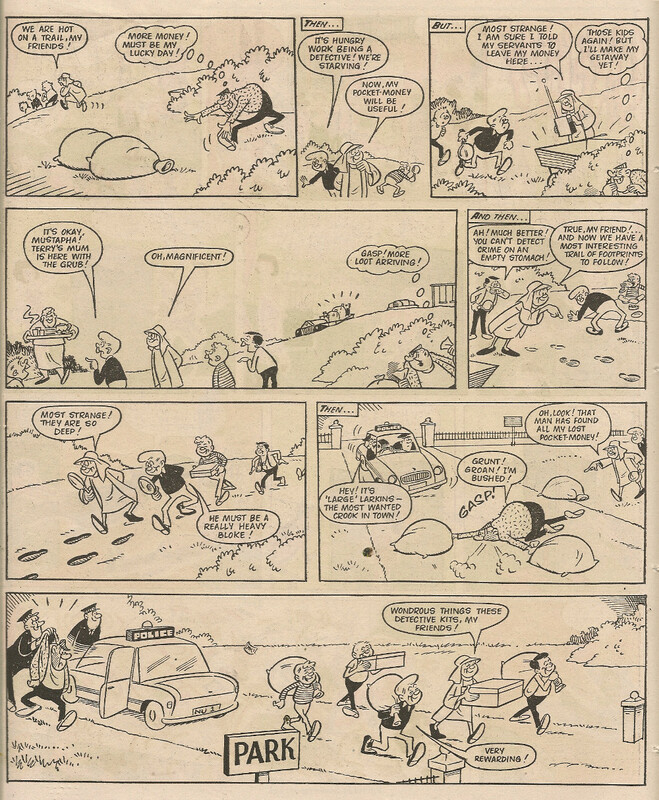 The two-page Saturday feature in that issue showed Teacher leading Cheeky and pals on a country ramble. 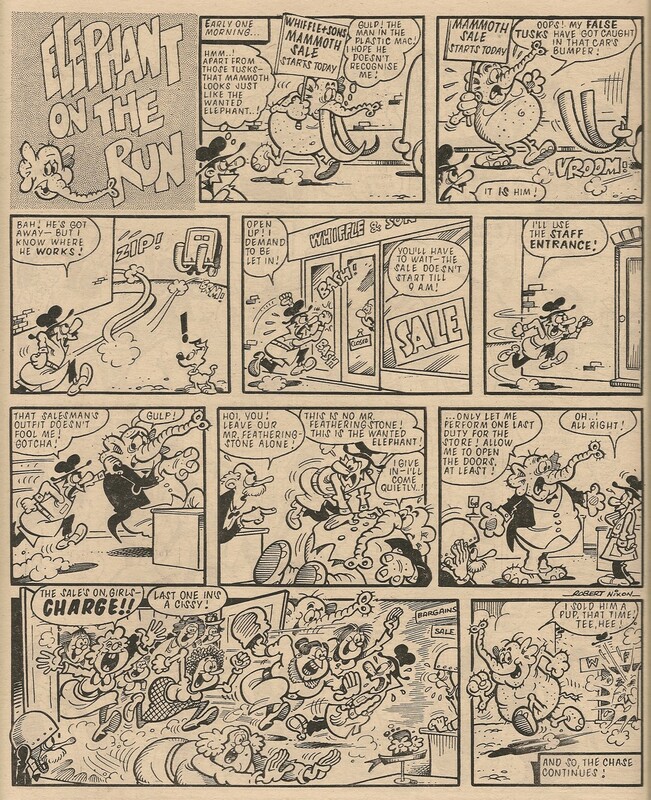 Naturally, it wasn't very long before the toothy funster encountered Krazy Town's rustic jokesmith, Farmer Giles. 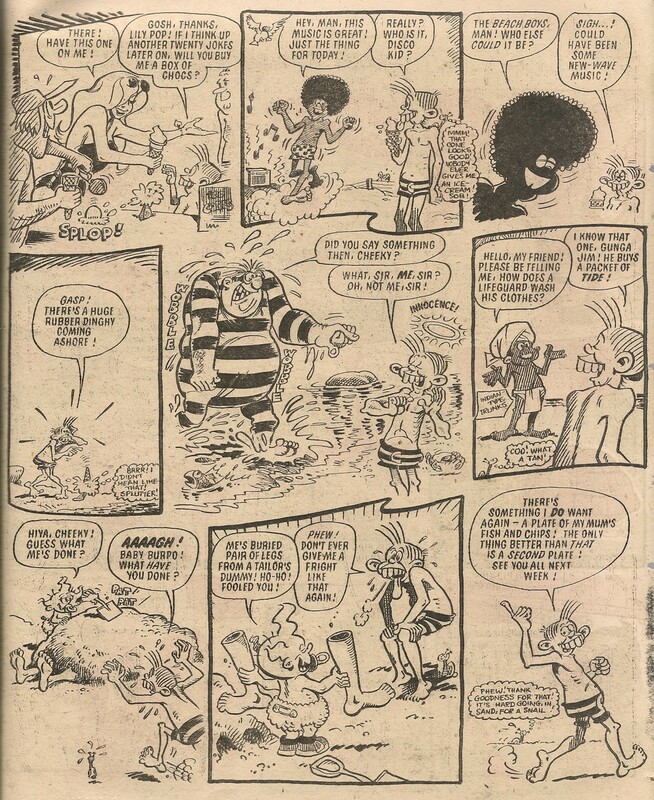 However, as the ramble progressed onto its second page, our grinning pal had a humorous brush with a country squire who, despite being allocated a name, never appeared in the comic again. The great Great News blog's latest retrospective ramble arrives at a copy of Whoopee! and Cheeky. Ministering to the spiritual needs of the various obsessives that populated Krazy Town was surely an unenviable task, but the Vicar remained cheerful despite the odd nature of his flock. 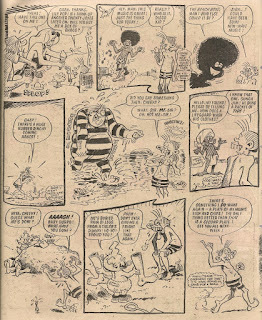 The comical clergyman (who was created for Cheeky Weekly and hadn't previously appeared in Cheeky's strips in Krazy) made his debut in the first issue of the toothy funster's own title, and went on to revel in religious raillery in a total of 68 issues. Never without what we originally assumed to be The Good Book under his arm (but revealed on many occasions to be a one of a selection of tomes with joke titles), the Vicar's first gag centred on his two children, neither of whom ever appeared again. 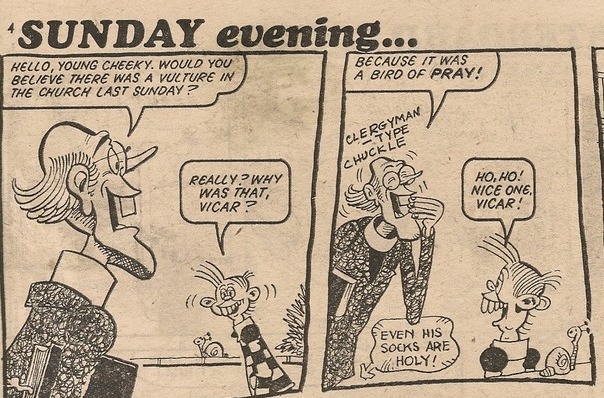 Vicar appeared most regularly in the Sunday evening element of Cheeky's Week, a feature that was dropped from Cheeky Weekly as of the 30 September 1978 issue to make way for the inclusion of The Mystery Comic. 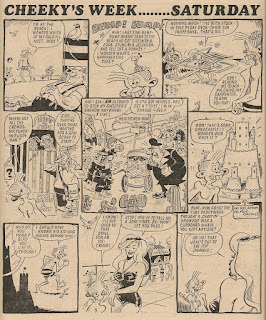 In Sunday evening's 48-issue run, Vicar appeared on that page in 39 editions (Vicar also featured in the Christmas 1977 issue on the Boxing Day page, which that year was on a Sunday). Following the demise of Sunday evening, Vicar was most regularly to be found on Saturday. 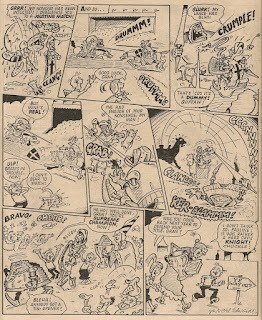 Possibly the result of a decision by the editor to avoid any contentious matters that may have arisen from his inclusion on such significant days in the Christian calendar, Vicar was absent from Christmas Day 1977 (there was no Christmas issue in 1978 due to industrial action), Easter Day 1978 and Christmas Day 1979 (which was in the comic titled Tuesday; although inconsistent, this was logical because that was the day of the week on which the celebrations fell that year). 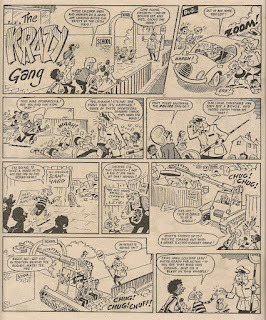 Of course, as would be expected in a mainstream title for children, the humour derived from the Vicar's presence on the streets of Krazy Town was of an entirely innocuous, pun-based nature. Our cheerful church-based chum's nemesis was Herman the Traffic Warden, who had a fondness for affixing parking tickets to the vicar's velocipede. 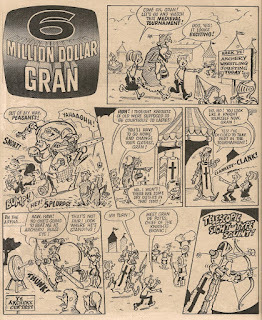 Vicar's first cover appearance was on the comic dated 11 February 1978, where he was among that week's Joke-Box Jury panel as they were given a front page boost. 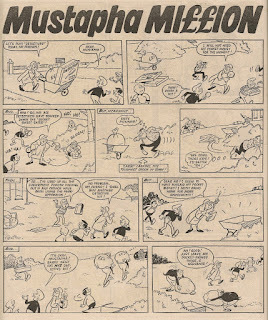 A month later, in the 11 March issue, Vicar was to be found at the opposite end of the comic, where he was the subject of that week's Pin-Up Pal poster. The mirthful minister was again on the cover, this time featuring alongside our toothy pal in a What a Cheek strip, on the front of the 05 August 1978 edition. 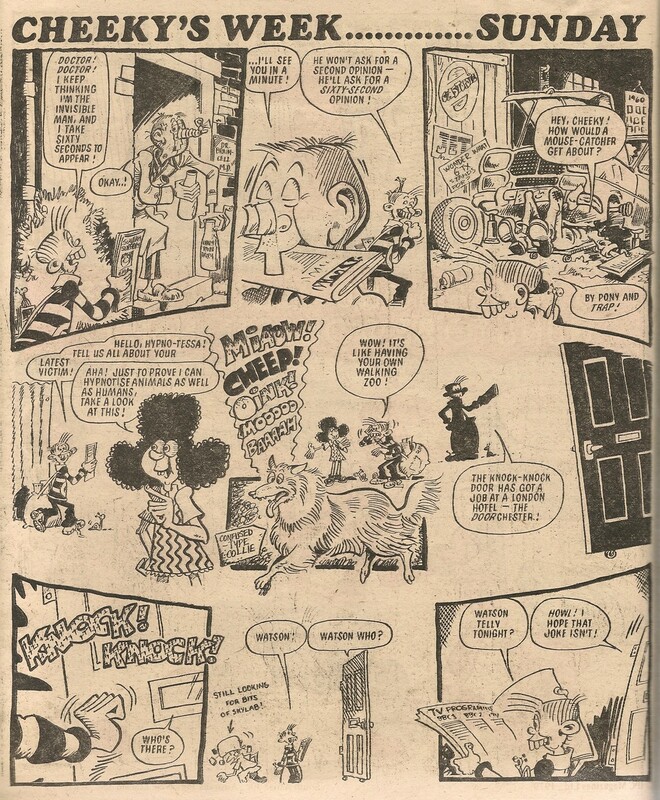 Vicar, developing a reputation as something of a party animal, was seen toasting the new year (with a drink poured from a bottle labelled Pop) at the Cheeky family's new year party in the comic dated 13 January 1979. 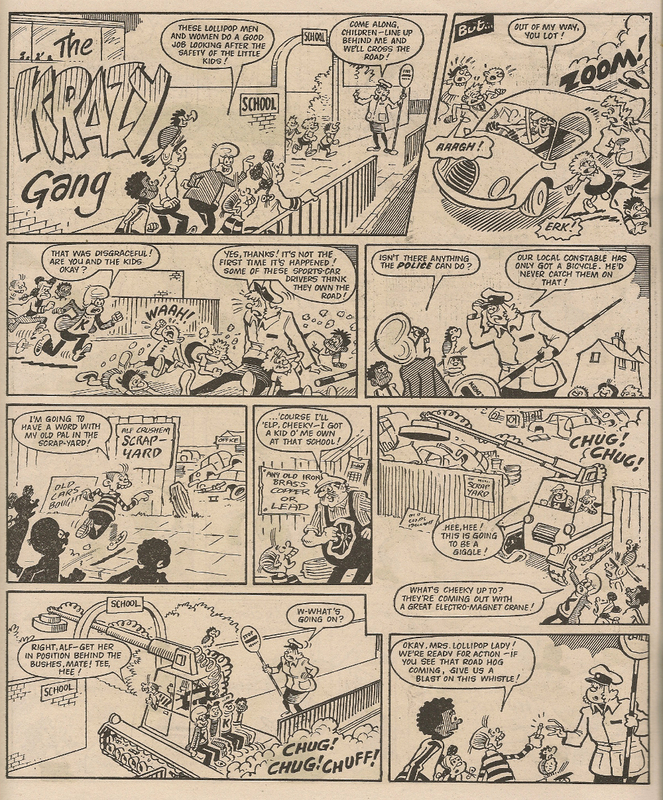 The second instalment of the Cheeky Snap Game occupied the centre pages of the 20 January 1979 issue, and a selection of the cut-out cards featured on that week's cover, including one bearing a likeness of the Vicar that was in fact the same image that graced the Pin-Up Pal poster back in March 1978. 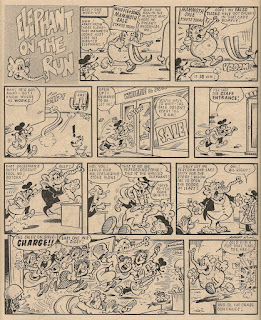 The Vicar fired the starting pistol at the commencement of Krazy Town's cross country run in the comic dated 04 August 1979. He was also at the finishing line to welcome home the surprise winner, not realising at the time that his bike had yet again been the subject of Herman's attention. 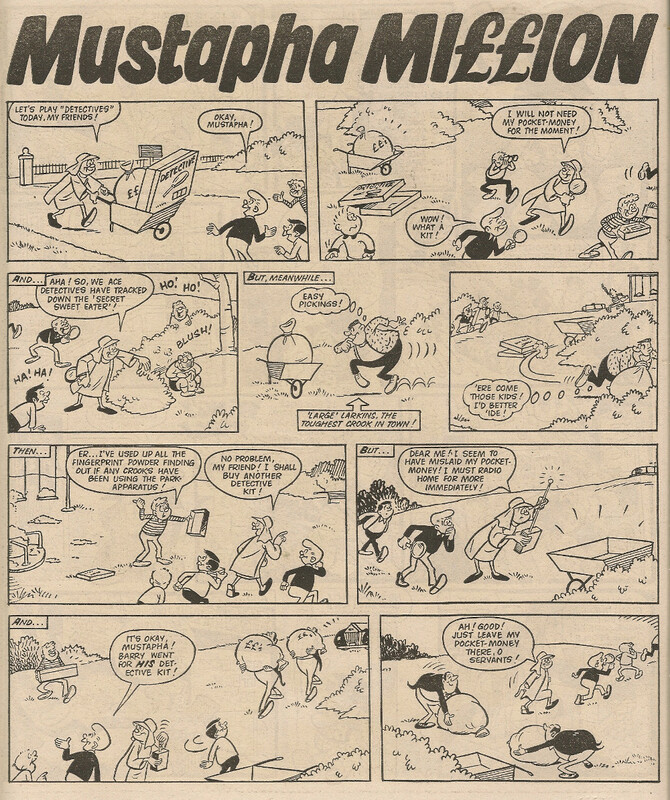 Our preaching pal's fourth and final cover outing was on the front of the 01 September 1979 edition. 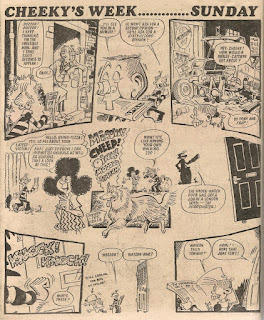 Vicar's penultimate appearance was in the comic dated 05 January 1980, where he was yet again glimpsed at the new year festivities chez Cheeky. Sadly, despite his plethora of parish puns, we never learned the risible rector's real name. Moonraker, the fourth James Bond film to feature suave star Roger Moore as the British super-agent, and the first (and only) 007 outing to be influenced by the Star Wars phenomenon, had its UK premiere in late June 1979. 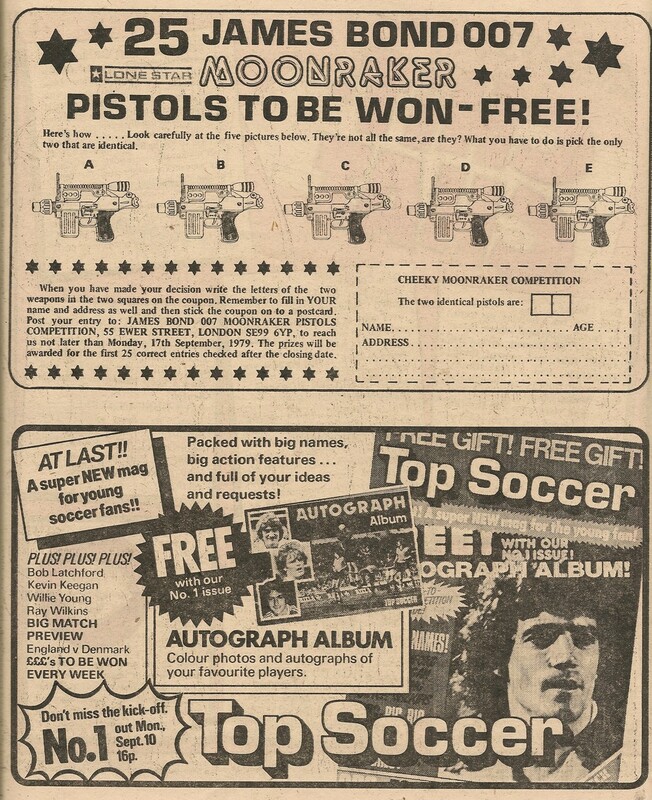 Our favourite comic is thus a bit late in jumping on the promotional bandwagon, announcing on the cover of this week's issue a competition to win a replica of the gun toted in said film by the gadget-wrangling secret service operative while aboard a space station. 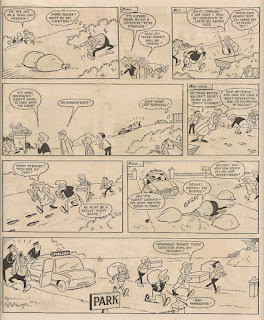 Below that announcement, the ever-reliable Cheeky/Manhole Man double act furnishes us with an arctic rib-tickler. I don't know what the pig has been using as a loo but I note that there's an awful lot of yellow ice about. The toothy funster evidently undertook a swift trudge across the tundra as he's back on the streets of Krazy town by page 2, doing his usual Sunday paper round. Further space station-related matters arise as Frank McDiarmid references pioneering orbiting vessel Skylab which, amid much speculation as it reached the end of its mission about possible damage and injury that may have resulted from its planned (uncrewed) destruction on re-entry, made a not-entirely-controlled-but-non-injurious return to Earth, with remnants landing in Australia on 11 July 1979. 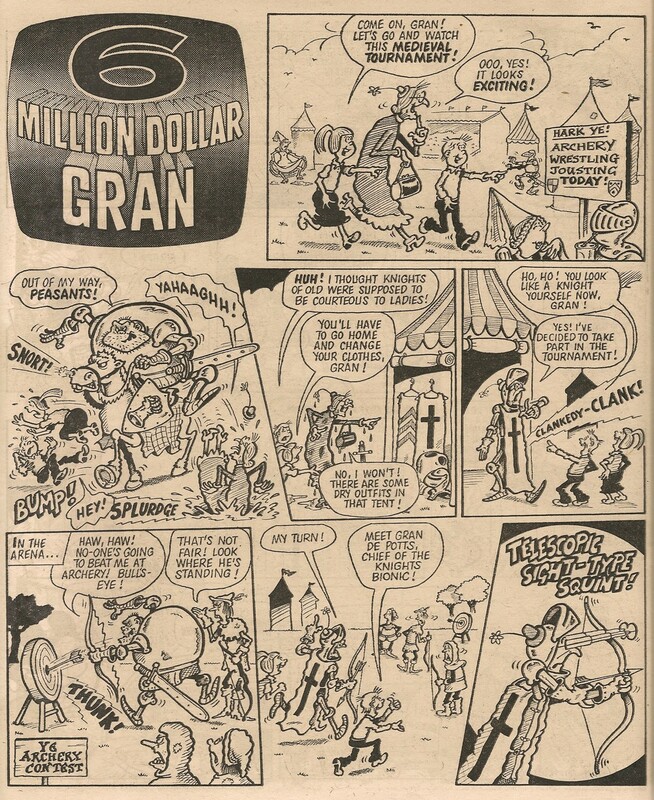 The final panel of the Sunday page seems very much like it's going to turn into an introduction to the 6 Million Dollar Gran story that follows, but as documented here, Cheeky's intros to the Gran strips came to an end in the 30 July 1979 issue. 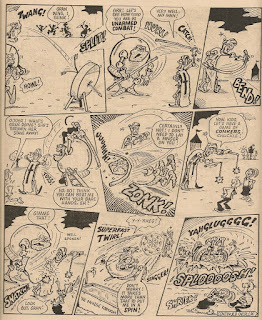 Nigel Edwards deputises for Ian Knox on 6 Million Dollar Gran for the twelfth time, depicting the aged automaton's visit to a medieval tournament. 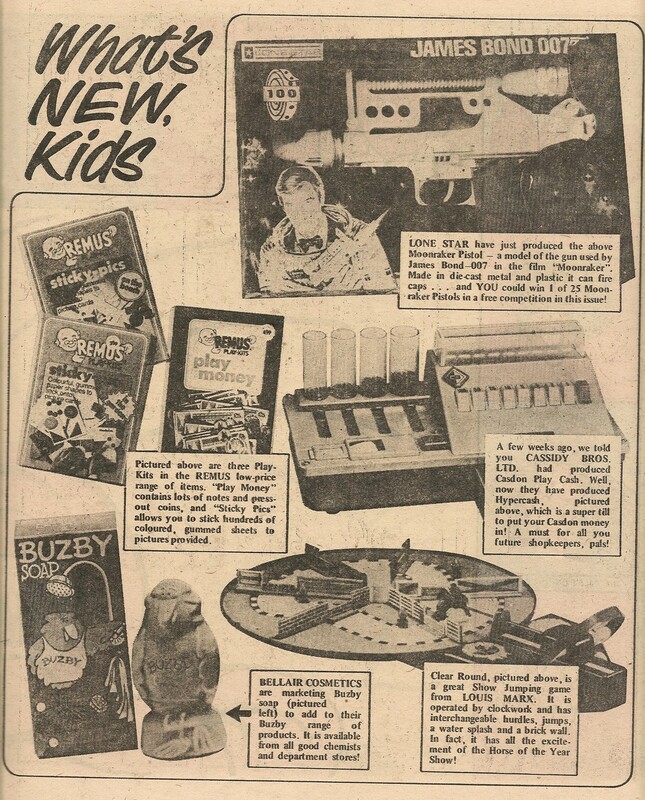 Gran clearly has a liking for these events as she previously attended one in Cheeky Weekly dated 30 June 1979. 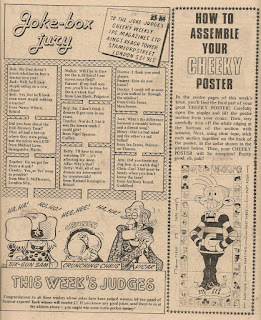 The Joke-Box Jury panel is reduced to three members this week as the gag-evaluating team share a page with the assembly instructions for the giant Cheeky poster which concludes this week with the upper half of the toothy funster's grinning fizzog. Things look very grim for our favourite fugitive elephant. 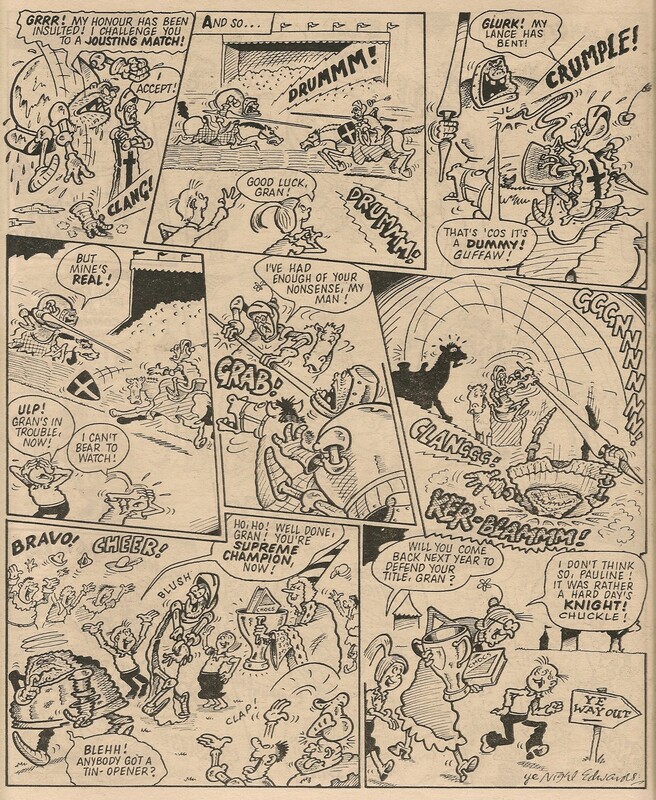 I like the panel showing the stampeding bargain-hunters - Robert Nixon uses a nice, loose, kind-of-goofy style on Elephant on the Run that I'm not sure I've seen in his other work. This style really suits the daft nature of this feature. Lovely stuff. 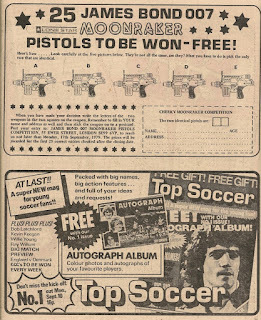 Page 15 is the location of the latest What's New, Kids advertorial feature, and prominence is given to the Lone Star Moonraker Pistol referred to on the cover. Cheeky enjoys a late summer visit to the seaside on Saturday. 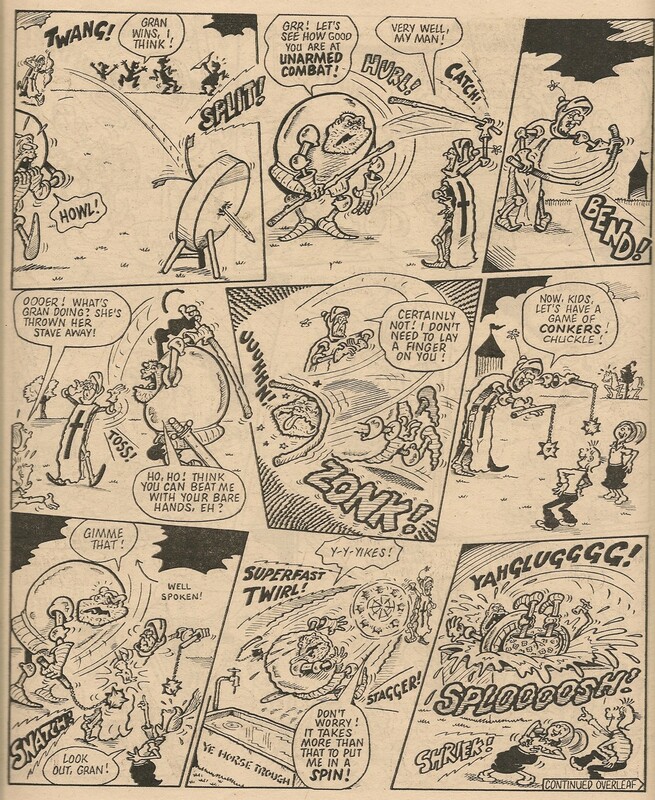 The back garden banter of Snail of the Century once again brings the comic to a conclusion. 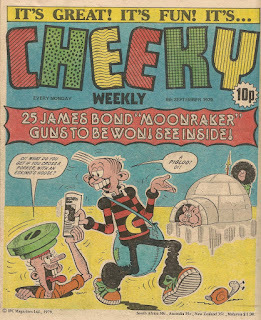 Frank McDiarmid provides all 9 fun-filled Cheeky's Week elements this issue.